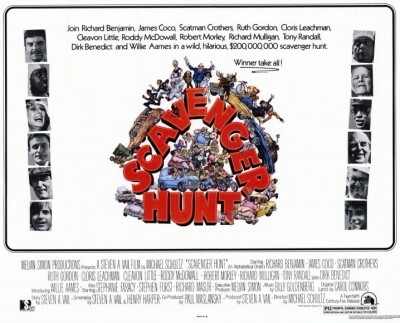 Scavenger Hunt (1979) is an object lesson of film comedy, in the bad sense. Deliberately imitative of It's a Mad Mad Mad Mad World (1963), it works more or less from the same premise and basic structure, but where Mad World was a popular and critical success and remains immensely enjoyable, with a cult following more than 50 years after it was made, Scavenger Hunt received mostly terrible reviews and was instantly forgotten. And though released to videocassette in 1983, it was one of those late-1970s/eary-1980s movies that seemed to fall in a home video black hole for many years (Heartbeeps, anyone? Americathon? ), finally making its DVD and Blu-ray debut just last month. It's an interesting film for its not-quite all-star cast, all of whom try hard, but mainly as a critical exercise. It's a Mad Mad Mad Mad World's popularity has through the years spawned a handful of imitators - the other notable ones being Million Dollar Mystery (1987) and Rat Race (2001) - and none are any good, mainly because their writers just don't understand the formula to Mad World's ingenuity. Kino's new Blu-ray offers a decent transfer and some good extras, with especially good interviews with two of its stars. The story and co-screenplay by Steven Vail lacks the elegance of Mad World's set-up. Game tycoon Milton Parker (Vincent Price) dies and in his last will and testament leaves his $200 million fortune to the victorious winner of an elaborate scavenger hunt - winner take all. (He does this to punish his greedy heirs, except that many of them aren't.) Five groups of "contestants" form alliances: the servants, consisting of French chef Henri (James Coco), butler Jenkins (Roddy McDowall), chauffer Jackson (Cleavon Little), and housemaid Babbette (Stephanie Faracy); his widowed sister, Mildred (Cloris Leachman), her 30-year-old nitwit son, Georgie (Richard Mauser), and attorney, Stewart (Richard Benjamin); nephews Kenny (Willie Aames), Jeff (Dirk Benedict), and Mildred's defecting daughter Lisa (Maureen Teefy); his son-in-law widower Henry (Tony Randall) and his four children; and dim-witted taxi driver Marvin (Richard Mulligan), who eventually partners up with a security guard (Scatman Crothers). The competing groups have until 5:00pm that day to collect the most points, with each outrageous item (a live ostrich, a toilet, a safe, etc.) raging in value from 5 to 100 points. In It's a Mad Mad Mad Mad World, five sets of motorists stop along a desert highway to aid a single car crash victim, who on his deathbed "bequeaths" his stolen fortune, $350,000, buried in a state park some 200 miles away. One of the reasons Mad World works so well and Scavenger Hunt doesn't is because the earlier picture builds slowly and methodically. Initially, the parties in Mad World act like reasonable if increasingly greedy adults. Initially they propose working together and sharing the money "providing there is any money." They can't get along, however, and pretty soon it's every man for himself and every woman for herself. In Scavenger Hunt, everyone is frantic from the start without any build-up at all. In Mad World, the comedy is grounded in reality until the climax (the fire escape and ladder business), by which point its outrageousness is acceptable because getting to that point has been so carefully constructed and even rational. And where Mad World's protagonists were basically decent, ordinary and thus identifiable and sympathetic people, those in Scavenger Hunt are either irredeemably greedy (Leachman, Benjamin) or cartoony stereotypes (French-accented chef, dumb-as-a-bag-of-hammers maid, etc.). In Mad World the characters have a simple goal: reach a destination 200 miles away first and dig up the dough before the others arrive. In Scavenger Hunt, the game itself is silly, highly repetitive, and pretty quickly becomes tiresome. It's like watching a two-hour movie where characters get very agitated playing Monopoly. Since rules forbid buying items in the hunt, most resort to simply stealing what they want. In Mad World the characters often pause to consider their actions ("What about the damage?"). No one in Scavenger Hunt questions the wisdom or potential criminal fallout of, say, kidnapping an ostrich from the zoo, how they're going to feed it, sneak it back or anything. Yet another problem with Scavenger Hunt is that while its cast is mostly composed of talented actors, with a few exceptions most lack clearly defined screen personae that works as a kind of shorthand in Mad World. When, for instance, in Mad World Phil Silvers turns up about 40 minutes into the film, the audience instantly knows what to expect from this character, that he's going to be, essentially, a Sgt. Bilko-type conniver in civvies. The actors give it their all and in this one respect the movie can't be faulted. Tony Randall has an almost-funny scene with Arnold Schwarzenegger, the latter playing Lars, a gym owner trying to press Randall into a workout when he's only looking to borrow a medicine ball. Pat McCormick has a mildly amusing scene as a carnival barker. Mostly though, when one considers what its cast can do when given good material (Benjamin in The Sunshine Boys, Leachman on Mary Tyler Moore, Randall on The Odd Couple, etc.) they're all clearly working far below their capabilities. It's particularly disheartening to watch somebody like Cleavon Little, so funny in Blazing Saddles, wasted in a nothing part with no character to play. Licensed from Fox, Scavenger Hunt looks okay, presented here in 1.85:1 widescreen, the image on the grainy side, due to the type of negative film stock of the era rather than the 1080p video transfer. The mono DTS-HD Master audio is pretty good on this Region A encoded disc. Supplements include an audio commentary track with affable director Michael Schultz, as well as two charming on-camera interviews, each running 10 minutes, with Richard Benjamin and Richard Mauser. Enlightening, interesting material here considering how underwhelming the feature attraction is. Not at all good, but almost fascinating for its cast and the wrongheadedness of its approach to comedy. Worth seeing once, and thus a Rent It.